Email is one of the most integral parts of modern life, and modern learning. Because of this, it’s no surprise that your Axis LMS is going to sending emails out to your users. Axis v10.6 breaths new life into your emails, helping to improve their reliability, and introducing new options. A backend overhaul of the Axis emails has already made an improvement on the integrity of your Axis emails; and this overhaul also allowed for the standardization of all the emails sent out across the entirety of your system. 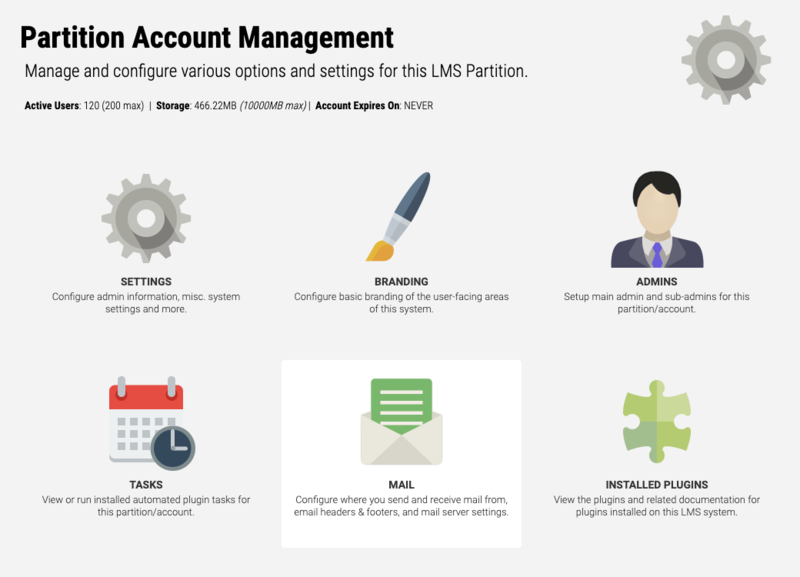 As one improvement led to another, a new section has been added into your Administrator System tab, allowing you to make sweeping changes to affect all the newly standardized emails. 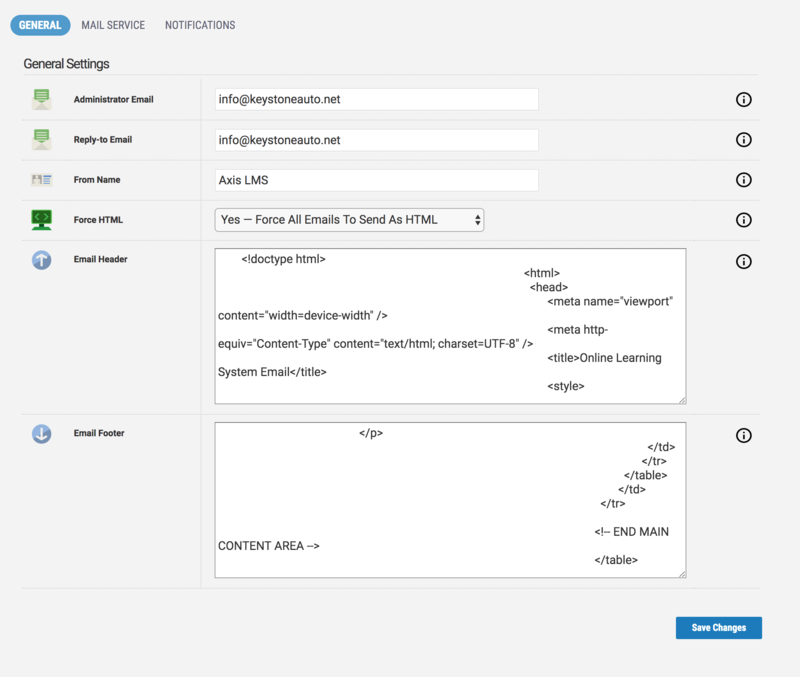 The most visually impactful is the optional HTML wrapper you can now wrap around every email sent out from the LMS. Initially sporting a blue theme, you can choose to change nearly every aspect of the wrapper, with font and background bringing the most impressive changes. 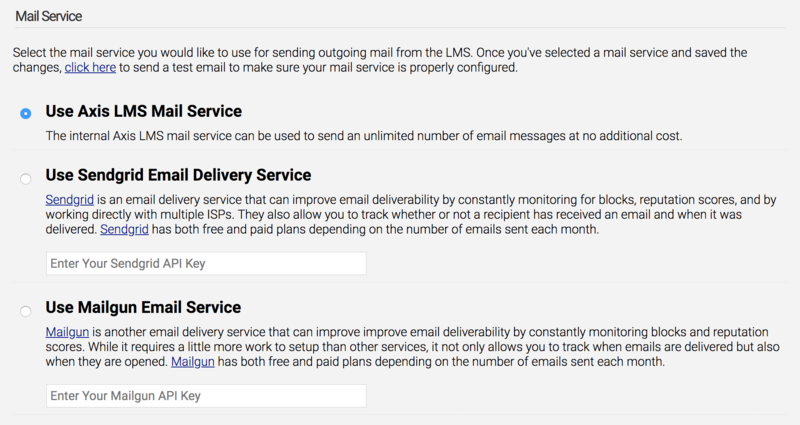 The footer of the wrapper also implements new elements to allow your LMS’s emails to comply with several CANSPAM regulations, further improving your emails deliverability. And for administrators who want to be able to interact with their users outside the LMS, new fields have been introduced for your emails, allowing you to specify a Reply-to address (if a user should ever reply to one of the system generated emails). What is perhaps the most functionally impressive innovation is the capability to integrate with 3rd party emailers. Two non-Axis emailers have been introduced which will funnel all emails your Axis LMS would typically send through these independent services. Both services (SendGrid and MailGun) provide you with new reports and email-related data that would otherwise be unavailable through the LMS. This data can help you better track the deliverability of your emails, and other information; such as the open rate for the emails you send. This entry was posted on Monday, April 15th, 2019 at 12:11 pm	and is filed under ELearning 101. Responses are currently closed, but you can trackback from your own site.